On UsuryFree Day, November 13th, 2012, we have a very special task – to announce the launch of The Year of UsuryFree Living - which will extend until the end of the 9th Annual UsuryFree Week on November 19th, 2013. 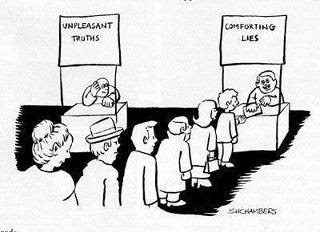 During this year it is out intention to keep on teaching "unpleasant truths" and exposing the "comforting lies" as spouted by formal education and the mainstream, print and electronic media. The Year of UsuryFree Living, which begins on November 13th, 2012 and extends to November 19th, 2013 is an ideal opportunity for debtors to re-educate themselves about the evil and immoral effects of the design flaw of usury. Re-educated debtors are encouraged to share their newly acquired knowledge with other debtors who are ready and willing to be re-educated. It is the intent that debtors everywhere will gain a greater appreciation of the possibility of experiencing a usuryfree lifestyle. Countless websites on the internet offer an abundance of relevant information and resources for study. Novices who are motivated to action during The Year of UsuryFree Living will find that, The UsuryFree Eye Opener – the electronic arm of the UsuryFree Network is a good starting point where there are over 500 postings of relevant information for review, sharing and putting into practice. As well we recommend regular visits to our twin blog - The SDI (Self Directed Income) Eye Opener. In order for debtors to be re-educated, they must be ready and willing to acquire knowledge beyond the walls of formal education. During The Year of UsuryFree Living debtors are encouraged to become students once again, learn “what they didn’t know they didn’t know” and then teach this newly acquired knowledge to others. Given the ease of modern technology, the truth about (a) the problems regarding the modern money creation of usury-based debt money and (b) the solutions as offered by the popular, usuryfree time currency movement can go viral at a rapid rate. Consider what happened when a young student, 12 year old, Victoria Grant posted a brief discourse on banking at YouTube earlier in 2012. Victoria Grant was nominated for a Winged Lion Award - which she will receive during the 8th Annual UsuryFree Week from November 13th to 19th, 2012. The posting by Victoria Grant went viral very quickly because she spoke the truth about modern money creation. Many viewers re-posted the video clip and various alternative media outlets interviewed Victoria Grant. If a single 12 year old student can make such an impact, then debtors everywhere are invited to become re-educated and then make a commitment and resolve to take action to throw off the shackles of usury during The Year of UsuryFree Living. While economic re-education is a personal goal and everyone’s work and family schedules are different, thereby determining the rate and speed of acquiring and assimilating new knowledge, know that the process of individual re-learning will eventually fuel the collective mind set. What we learn from reading, viewing video clips and/or full length documentaries and communicating directly with others, we can ignore BUT we cannot unlearn the truth about the function of usury and how it keeps debtors financially enslaved and wholly subservient to creditors for generation after generation. Once re-educated, it becomes our responsibility to share our knowledge and resources with others who are ready and willing to be re-educated. It is through applying the knowledge that eventually we will individually and collectively experience the joy of a usuryfree lifestyle. We gain this knowledge – not likely from formal education – but rather from our self-imposed course of study whereby we learn from printed words, audio presentations, short video clips, full length film documentaries, seminars, workshops and private conversations with others. Indeed, we are all students and we are all teachers. We must learn to express what we learn, assimilate it and share it with family, friends, neighbours, working colleagues and within our respective local and online communities. If someone demands an accounting, be prepared to find answers if you do not know the answer yourself. It is important that we defend the possibility and probability of experiencing the reality of a usuryfree lifestyle. Point out that in the past there was “Life Without Usury” and predict that there will be “Life Without Usury” in the not-too-distant future. After all, given a choice (a) to pay usury or (b) to NOT pay usury – which would you choose? On November 13th, 2012, at Conspiracy Culture in Toronto, Ontario, Canada, the Year of UsuryFree Living will begin as we celebrate the 8th Annual UsuryFree Day/Week. This is a significant milestone, as planned events beyond the borders of Canada remind us that UsuryFree Day, UsuryFree Week and The Year of UsuryFree Living have acquired international recognition. During the Year of UsuryFree Living, the economic world of usury-based, debt money may or may not collapse into oblivion, but as more and more debtors awaken and become re-educated, their collective influence will help accelerate the ongoing shifting of consciousness. Our ultimate resolve with be The UsuryFree Resolution – without the Revolution! We simply resolve to promote and foster proven, economic models of usuryfree living, thereby allowing the broken model of usury-based, debt money to eventually collapse and disappear. The end result will be that usury is eventually abolished forever, and there will be peace, prosperity, and abundance for every debtor – anywhere on planet earth. In summary, the Year of UsuryFree Living – from November 13th, 2012 until November 19th, 2013, is a time to expose the lies, deceits and deceptions about the design flaw of usury and how it is directly and/or indirectly the cause of violence, wars, poverty, scarcity and lack. And as a worthy alternative, we will promote the usuryfree lifestyle whereby debtors learn how to create and spend their own usuryfree time currency. Debtors will become excited when they realize they can experience a taste of peace, prosperity, and abundance by learning how to launch a usuryfree time currency to facilitate trades or exchanges when they shop in their local community. The practice of bartering or trading locally was widely observed in the past and it is being re-invented with the growing popularity of the “shop local” phenomenon. Know that during these transitory times, it will be necessary to negotiate trades or exchanges using a combination of federal cash and usuryfree time currency. It is commonly agreed that federal cash is required to cover any essential wholesale costs of a product or service, while a usuryfree time currency can be accepted for the retail mark-up portion of any negotiated sale. Recommended projects for The Year of UsuryFree Living are: (a) bookmark, read and share posts at The UsuryFree Eye Opener and elsewhere (b) bookmark, listen to and share the link for Wayne Walton’s UsuryFree Radio Talk and Do Show (c) launch a usuryfree time currency in your respective local communities and (d) find a software developer who has the skills and talents and time to create an open-source software that will facilitate the building of the biggest online database of local and global time traders. It is quite likely that initially, all time-traders will require dual accounts – one account for trading with usury-based, debt money and another account for trading with a usuryfree time currency. May The Year of UsuryFree Living become the catalyst to usher in the new age of UsuryFree Living for everyone on planet earth. And please review the article titled “A Fundraising Opportunity For The UsuryFree Network” and learn about our fundraising project for The UsuryFree Network and if possible make a commitment to participate.